Petoskey Bling has heads turning left and right. Who doesn’t love jewelry with inspiration from Mother Nature herself? 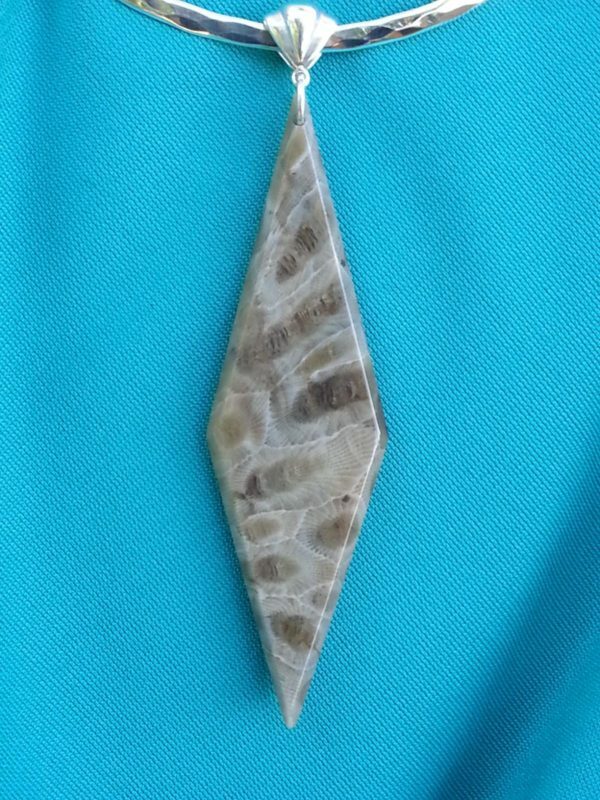 Petoskey Bling is jewelry made directly with fossilized coral found in Petoskey, Michigan, in its natural habitat. Petoskey is a beautiful place people in Detroit or Metro Detroit like to call “up north.” Sun, sand, beaches and a relaxed atmosphere is what Petoskey is all about, but trust us when we say, there’s nothing chill about Petoskey Bling. Petoskey Bling brings class and glam at the same time with a little Michigan vibe. To give a little background, the Petoskey Stone, the Michigan State Stone, is a fossilized coral found primarily in Petoskey Michigan. Traces of this fossilized coral are found within 100 miles from Michigan shore, but it’s called the Petoskey Stone because the only ‘Petoskey Coral reefs’ in the world, are found in the vicinity of Petoskey Michigan. 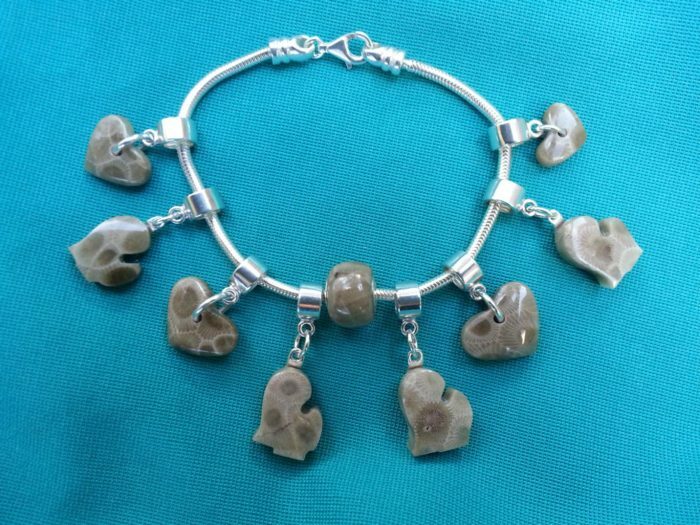 A well shaped, ground and polished Petoskey Stone, is one to swoon over. 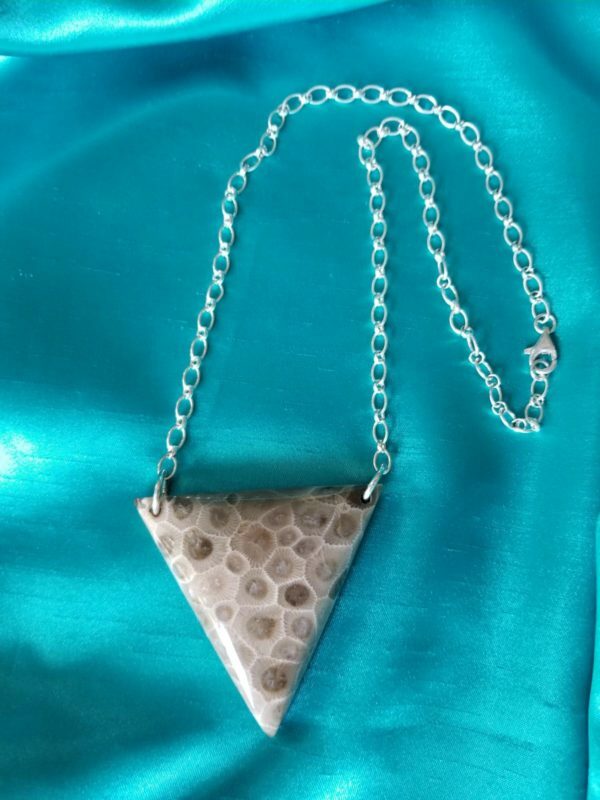 The Petoskey stone is one of the few six-sided fossilized corals in the world, and Joyce Czarniowski creates beautiful jewelry based on its natural beauty. Please read our interview with Joyce Czarniowski to learn more about her work and what inspires her. DFN: Do you collaborate with many local fashion designers? Czarniowski: As Cheryl Zemke being the first local designer that I have a had the pleasure to work with, it was a fantastic experience. Cheryl chose me to collaborate with her so we could show our ambition, passion, and our love for fashion. Showing our creations together woman supporting woman was inspiring. DFN: Tell us about your Petoskey Bling designs. What makes them special? DFN: How do find the right Petoskey stones? so each piece is handpicked like a fine diamond. I only use the Petoskey stones with rich, deep, beautiful, vivid corallites. DFN: What encouraged you to start creating this beautiful Michigan inspired jewelry? Czarniowski: It all started when my late husband & I started traveling to Petoskey, Michigan. I saw the beauty within the stone. They were like diamonds in the rough. I instantly knew I could make jewels of these treasures. DFN: What is the price range of your collection and how can one make a purchase? Czarniowski: My pieces are very affordable. The price range starts from $15 to hundreds of dollars. They are priced accordingly by the beauty of the corallites, the rarity of color, and intricate cuts, other precious stones used and the design paired with fine silver. One can make a purchase at my events which are listed on my website Petoskeybling.com. Or, orders can be emailed directly to me at [email protected] I do special orders for any occasion and will even make jewels out of your own found treasures. DFN: How often do you introduce new pieces? Czarniowski: I show my new creations at every event as well as art & craft shows throughout the Metro Detroit area. DFN: Do you have any shows or collaborations coming up we can watch for? Czarniowski: I do have events coming up which can always be found on my website Petoskeybling.com. My next event is the “Winter Wonderland” art & craft show at Lutheran high school located at 33300 Cowan Rd. in Westland. My location will be in the New Gym, booth #12. My collection is also shown in the “Dedicated Magazine” August 2018 one year anniversary issue. Soon, I’ll be putting my collection in art galleries & jewelry stores throughout Metro Detroit. DFN: How would you describe your clientele? Czarniowski: My jewelry speaks to all ages. To the very young as well as to the very elegant sophisticated woman. Even for the man in your life … My designs are made for everyone to enjoy. DFN: Thank you so much for your time. I have a feeling our readers who love to travel “up north” will love your collection. Czarniowski: Thank you, Shannon, for taking the time to interview me. It was a great pleasure.